Taking the world by storm, Japan's Tomokau Harimoto has once again reached the top step of a Men's Singles podium on the ITTF World Tour after he edged out Zhang Jike on Sunday 10th June in a dramatic seven games epic at the Seamaster 2018 ITTF World Tour Lion Japan Open in Kitakyushu (9-11, 8-11, 11-9, 11-4, 10-12, 11-7, 13-11). 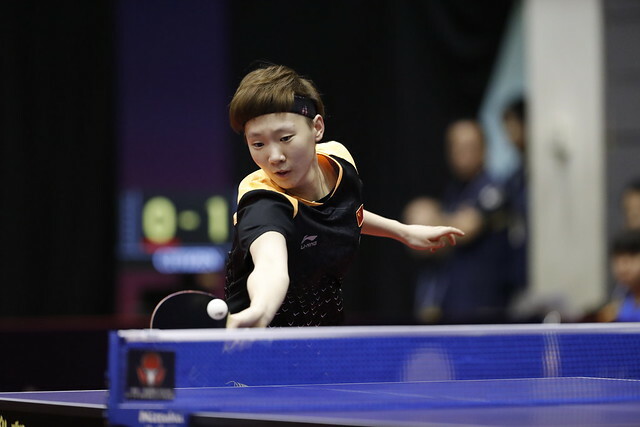 Meeting last week in the opening round of the 2018 China Open in Shenzhen, 14-year-old Tomokazu Harimoto won that tie convincingly in straight games but this time out the task proved to be much tougher. In a complete contrast to that meeting in China the opening two games in Kitakyushu were controlled by Zhang Jike, who prevented Tomokazu Harimoto from finding his stride. Then out of nowhere the momentum completely shifted in the Japanese teenage star’s favour as he went on to win game three by the narrowest of margins before displaying sheer dominance in game four to tie the scores up at two games apiece. Both Zhang Jike and Tomokazu Harimoto then experienced a tad of good fortune in the following two games: trailing 10-8 in the fifth, Zhang Jike recovered back-to-back points including clipping the back edge of the table before going on to win in deuce while Tomokazu Harimoto also pulled off a back edge winner on game point to send the match into a decider. Then came the most dramatic game of the final. Zhang Jike recovered from 5-1 down to establish a Championship Point in his favour at 9-10 before the Japanese crowd saw their player successfully pull level at 10-10 only to squander a Championship Point of his own. Holding a 12-11 lead Harimoto was once again just one point away from the title and this time he took it with an ace, falling to the ground in celebration before sharing a respectful handshake with his opponent. Tomokazu Harimoto now holds two ITTF World Tour Men’s Singles trophies to his name and has become the first Japanese Men’s Singles winner at the Japan Open since Masato Shiono in 2013. As for Zhang Jike it wasn’t the end result he was hoping for but he can be pleased with his outing as a whole in Kitakyushu, not only for breaking his long run of early exits but also for reaching his first final on the ITTF World Tour since 2016.